My flow chart goes like this: never used anything on my right arm except a shirt sleeve or a sock in the summer for decades. Then got hooked on the Abel guitar rest which I just loved, i.e., didn't realize I was "uncomfortable" until I started using it. I found the Abel rest tedious as you have to take it on and off to put the guitar in the case, it doesn't stay on well for some guitars and now, I suspect, my right shoulder was a bit higher than it should be sitting due to the added height of the rest. Enter the Luva hard arm pad. I was using this for lute playing only (for some reason the lute cuts into my forearm more than the guitar, probably because of added pressure to keep it from slipping). It was easy then to ditch the Abel support and just use the Luva hard pad for guitar and lute, though it took some adapting. I did this for at least a year or so. Now I believe during performance or other tense moments the hard pad allowed me to exert more pressure on the guitar than was needed since I didn't feel any discomfort at the contact point. Paying the price now. I've since put that away and being very mindful how much I am pressing on the right arm. I firmly believe this pad is not necessary if you are holding the instrument properly. Anyone else have an experience like this? If you use the hard pad, take great care with this. I used the Luva for a while too when I thought I experienced some trouble with pressure on the tendons in the lower arm, and to make it easier to slide the right arm along the guitar edge. But I no longer seem to need it either. I never got to the point where it bothered me, but I thought the sleeve was too short and it didn't always stay in place. I have had the issue of raising the right shoulder and the problems that can cause if you are not used to that. I don't know how e.g. Ricardo Gallén, or the many flamenco players for that matter, avoid shoulder pain. I have no idea how Gallen plays so well, if you close your eyes and listen, then open them and see him sitting like a folk singer its stunning. He has an Aranjuez video where he plays the whole concerto that way. Interesting, I think I'm on the same path. After a while I have a habit of slumping down onto the guitar. I think this is a symptom (or the cause!) of accumulating tension that I haven't quite mastered. My Luva arm pad has helped with the discomfort, but hasn't corrected the habit. Now I'm trying to correct the habit, which kind of makes the Luva pad redundant, since my arm--ideally--only makes very light contact with the bout. If I can get this corrected, I imagine that I'll ditch the Luva completely at some point. 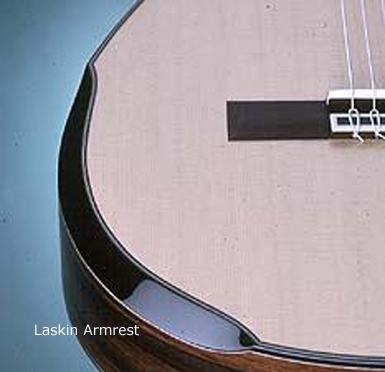 How do you find the normal armrests that come built into many guitars these days? souldier wrote: How do you find the normal armrests that come built into many guitars these days? Personally, I wouldn't get a guitar without one again. My last 2 commissions have armrests. They are very comfortable but I never had an issue with pressing hard into the side of the guitar. For me, it protects the French polished tops without having to wear a sleeve and also allows for more volume. Interesting theory Charles. I use the Luva. I will see if I exert extra pressure due to the pad. I guess it's a good reminder to always be alert to any unnecessary stress or pressure. The armrests that are built in typically do not provide a bevel, there's still a right angle that the forearm lays on. The Abel (clip on) armrest is the only one I've ever seen that actually makes it more comfortable to play. In fact if you have a guitar with a built-in armrest you obviously will not be able to use the Abel.